default servicing trusted reliable informed @ dsnews.com 11.2018 64 SLASHING THROUGH THE SERVICING JUNGLE Default servicing costs have skyrocketed over the past decade, leaving servicers lost in a jungle filled with compliance overhead, complicated investor rules, and unfair penalties. 68 THE ROCKY ROAD TO FEE RECOVERY A Court of Appeal has limited the lender's right to recover attorney's fees after successfully defending against borrower lawsuits challenging a foreclosure. That means a victory in court could still prove costly. 72 REBUILDING PARADISE More than a year after Hurricane Maria made landfall in Puerto Rico, the island faces many challenges along the road to recovery. DS News spoke to industry leaders working to facilitate that process. 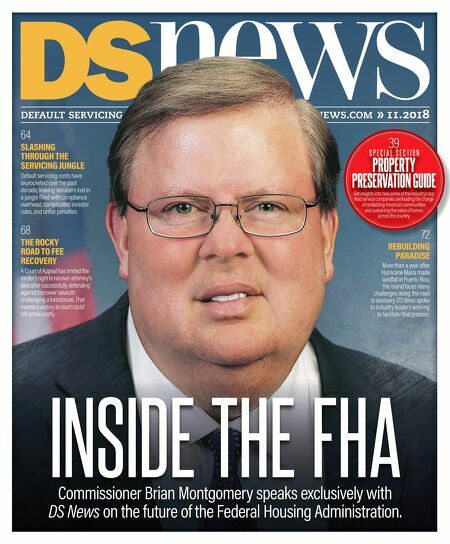 INSIDE THE FHA Commissioner Brian Montgomery speaks exclusively with DS News on the future of the Federal Housing Administration. 39 S P E C I A L S E C T I O N PROPERTY PRESERVATION GUIDE Get insights into how some of the industry's top field service companies are leading the charge of revitalizing America's communities and sustaining the value of homes across the country.